The rent at Bayside Arbors Apartments ranges from $1,040 for a one bedroom to a $1,950 two bedroom. Apartments in this building are about 17% more expensive than the Clearwater average. This is a pet-friendly apartment. 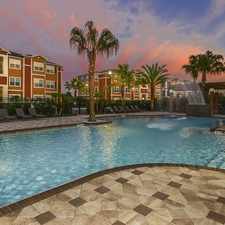 Bayside Arbors Apartments has a Walk Score of 41 out of 100. This location is a Car-Dependent neighborhood so most errands require a car. Escape from the city today... Bayside Arbors offers you a waterfront luxury apartment home tucked away on a shady bluff overlooking Old Tampa Bay. You will find pet-friendly apartment homes that are styled with open, airy interiors nestled among majestic oaks. Relax at the bayside pool or watch the dolphins play in the bay from your private corner balcony. Easy highway access makes commuting across Florida a breeze and our Clearwater location is just minutes from great shopping, dining, and more. The perfect style and the best location make Bayside Arbors Pet-friendly Apartments the premiere choice for luxury apartment living in Clearwater. Explore how far you can travel by car, bus, bike and foot from Bayside Arbors Apartments. Bayside Arbors Apartments has some transit which means a few nearby public transportation options. Bayside Arbors Apartments is in the city of Clearwater, FL. Clearwater has an average Walk Score of 43 and has 107,685 residents.